The revenge of Diane, Rhoda and Lucy! Well, I guess not revenge... There's not much for them to get revenge about... but STILL! Anyway, I hadn't drawn these guys as a group in a while and I wanted to practice drawing a single image with varying body types, and this is the result. I'm not entirely happy with it, but it was good practice and I know what I like / don't like about it for future reference. I'm not entirely sure how tall Lucy is in this drawing... 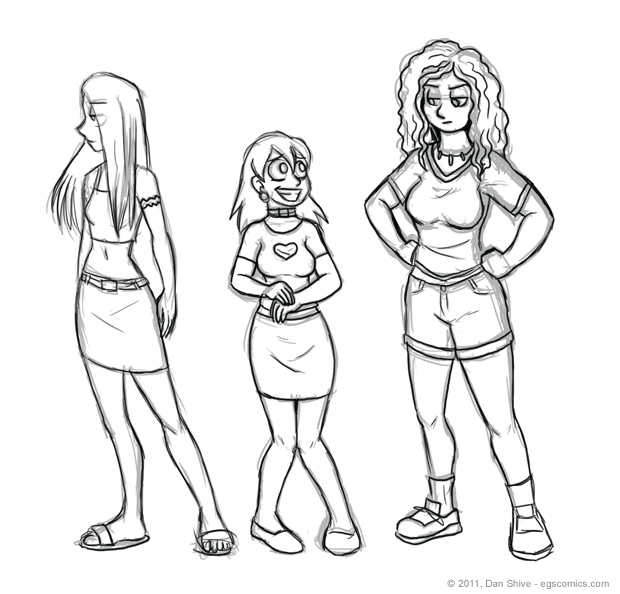 I drew Diane first, carefully scaled Rhoda so she would be 5' to Diane's 5'6", and then simply made Lucy a little bit taller than Diane. I think I'd like her to be 5'8", which may or may not be approximately what I wound up with here.